Karnak Temple in Luxor, Egypt is the second largest ancient religious site in the world, after the Angkor Wat Temple in Siem Reap, Cambodia. Construction at the massive site began during the reign of Senusret I in the Middle Kingdom (between 2050 BC and 1710 BC), when the city was still known as Thebes, and continued into the times of the Ptolemaic Kingdom (around 305 BC). The site was revered by more than 30 different pharoaohs and each one added something more to the complex. The photo above shows the Great Hypostyle Hall, which was erected between 1290 and 1224 BC. The 54,000 square foot hall was originally under roof, supported by 134 giant sandstone columns carved in the form of papyrus stalks. The roof caved in long ago, but most of the columns remain. Each measures nearly 33 feet in circumference and is carved top to bottom with inscriptions, battle scenes, religious symbols, and even the terms of a peace treaty. The most remarkable part of the columns, however, are the capitals, which are designed in the shape of papyrus flowers that are closed buds, opening, and fully blooming. The obelisk that is visible beyond the columns is one of two that were installed by Hatshepsut, a noble lady who became the fifth pharaoh of the Eighteenth Dynasty of Egypt. Only one survived; it is said to be the tallest surviving ancient obelisk on Earth. While undeniably huge, the part of the complex currently open to the public is only one out of four main areas. Excavation work, restoration, and research continue in the other areas. 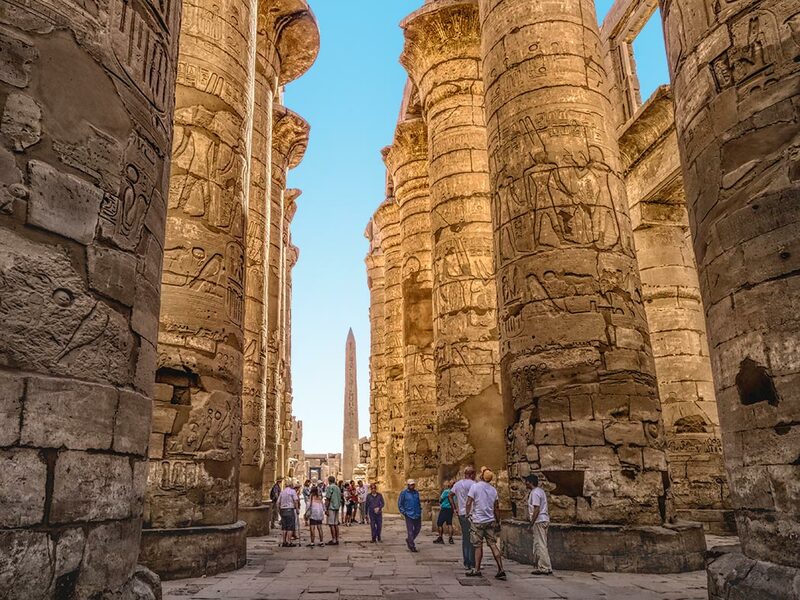 Today, Karnak Temple is the most visited site in Egypt after the Pyramids of Giza. No words to describe such an ancient and massive religious site. Its Amazing. Thank god that at least those pillars are there for the generations to see, even though the roof was collapsed. The snap is excellent. Thank you for writing such an informative article. Couldn’t agree more Nainital. Karnak was a spectacular experience.